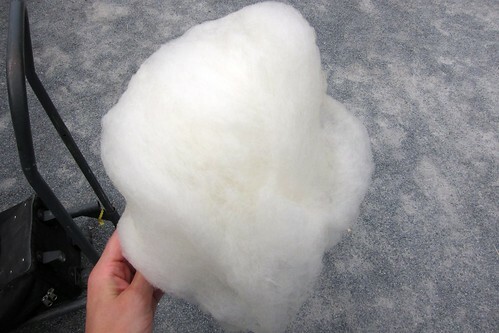 A few weeks ago, Liddabit, the Brooklyn-based sweets team and makers of my favoritest candy bar ever, started turning out fresh maple cotton candy at their market stalls around town. As a lover of all things maple, I was intrigued, but didn't come across one of their stalls until this past weekend. Afterward, I was a sticky mess that would make any mom FREAK! 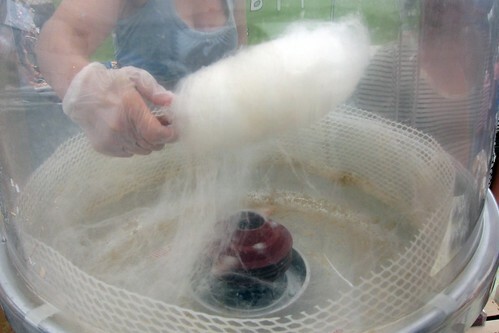 I'm still not entirely sure how cotton candy machines work. I know the sugar is warmed up and spun around. When the kid next to me wondered aloud to his mom, I told him it works by magic. I'm assuming Liddabit is using delicious maple sugar to make this ball of fluff. As I was eating the candy, I totally regressed back to my childhood, getting sticky sugar all over my face, hands, and hair and loving every minute of it. This little $4 treat made my weekend trip to Smorgasburg worth it. Liddabit will be back at Smorgasburg on August 20th and at New Amsterdam Market every Sunday this month.